Years ago, we believed that chameleons changed their body color to “match” their background – green while on a leaf, brown while on a twig, etc. Those of us who kept these interesting lizards began to question this theory, and we soon learned that the other factors were at play. Color change turned out to be an important mode of communication – expressing dominance, fear, stress, breeding readiness and so forth. As in many other species, color in chameleons may also be linked to temperature (darkly colored individuals can absorb heat quickly) and health. Recent studies at Australia’s Melbourne University have now brought us back to square one. Although the foregoing information holds true, it seems that at least 1 species, Smith’s dwarf chameleon, Bradypodium taeniabronchum, does indeed specifically change its color to match its background when threatened. Not only that, but it also tailors the degree of change to the specific predator. When faced with a sharp-eyed predator such as a bird, the lizard’s color changes to match the stick upon which it rests perfectly. Less well-sighted animals, such as snakes, elicit a less-perfect camouflage. It seems that color change exacts a heavy toll, physiologically, on the chameleon. This is likely the reason that it does not employ “perfect” camouflage unless forced to do so by the nature of its enemy. 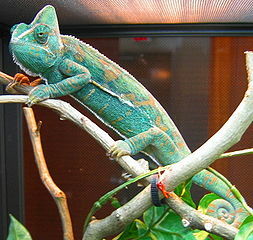 Chameleons hold a fascination for many people because of their rather over exaggerated ability to change colour. While they may not have the ability to match all the colours of the rainbow instantly some species do not need to: they are already half way there. Good point – the natural colors of most offer great camouflage without embellishment. First off what a great site, so much information about so many different reps and phibs…Brilliant. I have kept many Chameleons and have studied and researched them extensively. Have a look at my site i too have researched this topic and we seem to have found the same report.